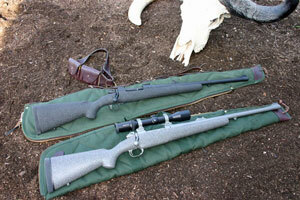 Shown: Pro Hunter Elite’s with Winchester Model 70 actions. Click on image for larger view. A deluxe version of our Pro-Hunter Rifle that features the Winchester Model 70 Super Grade action with controlled feed claw extractor. Includes fully blueprinted Winchester model 70 Classic style action, Match Grade stainless steel barrel, custom chamber, recessed target crown, 'glass bedded Brown Precision Alaskan style Fiberglas stock, Teflon metal finish (choice of color), 8×40 Magnum base screws, Talley custom scope mounts, banded express sights, barrel band swivel, Speedlock firing pin spring, finely tuned trigger.